as usual, each day from 4.00 – 5.30 p.m. 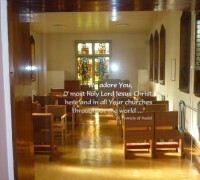 It would be great if some felt like joining us for prayer time when in Ennis. Each Sunday at 5:05pm we have Rosary, followed by Evening Prayer, Followed by Benediction of the Blessed Sacrament. You can write to us or email us and we will include your intentions in our prayer.